Infusing Eons of heritage, over the era of Internet. Dalmia is the 20th century Indian Industrial Monument, that came into existence before the Indian Independence. As a brand that is a benchmark of quality in all the products it deals with, the only aspect, it lagged was not having an image that was in tandem with the 21st century youthfulness. Olive and Dalmia met at such a junction in Dalmia’s timeline, when they wanted great changes to be made in the company and their image to not only promote and celebrate the youngest nation in the world, but to imbibe it to its very core. 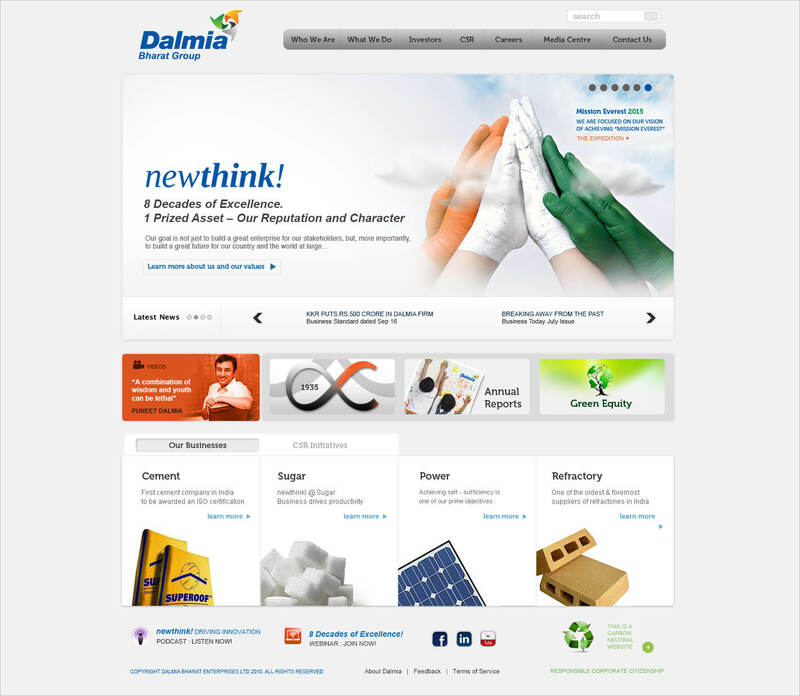 With Dalmia, our work surpassed that of building a cutting-edge website. We were tasked here to build and create a philosophy that had the wisdom of their heritage and the potency of youthful poise. We got down to discussing many aspects of the company with its management and during a deep, insightful session found a very endearing quality that ran deep into the group work culture, a quality that was not reflected at that time through their corporate image.The group had coined “New Think” to take the brand philosophy forward and we gave this thought a multi-dimensional persona in the online space. Each business was thus represented with a new-age perspective blending in the power of ‘Wisdom and Youth’ that are the drivers of the success story at The Dalmia Group. 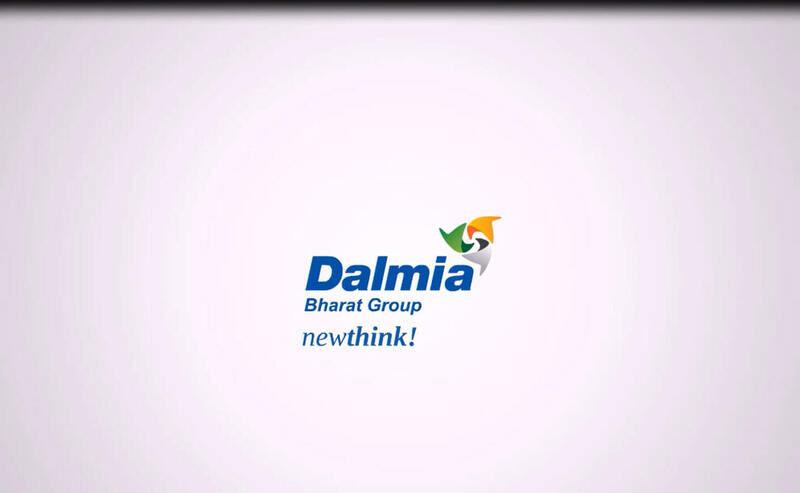 We began by designing a digital campaign that not only used the ‘New Think” philosophy as a launch pad, but the very tool to drive Dalmia’s new image across. The bigger picture was to have this philosophy revolve around everything and to ingrain this philosophy in all the aspects of the website. The goal was to come up with a design that stood as a corporate identity and oozed a youthful energy through it. The website was crafted to give a very clean look, the visuals were kept compelling, relevant and minimalistic. The banner designs, and the content that went over them, were made to give a humanized connect. Events like Mission Everest were given deep, meaningful, yet minimalistic visuals that resonated with the patriotism and youth power. Our effort was to tell a compelling story through each and every design facet. 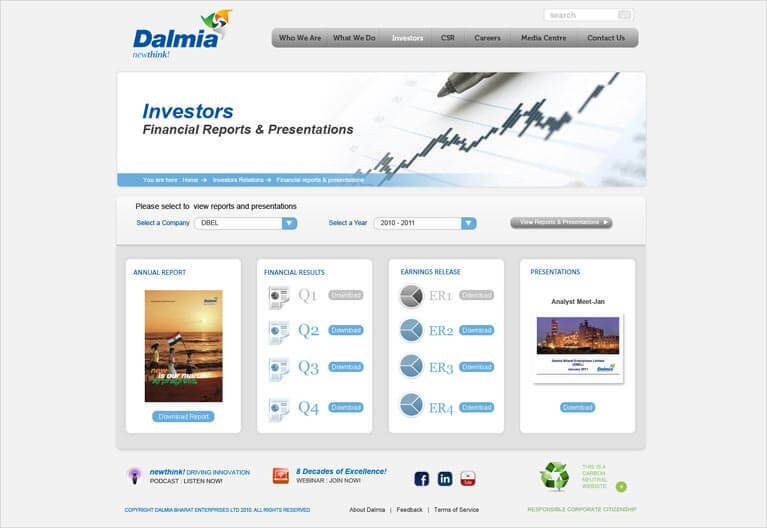 The investor section was designed with usability at its core where everything was segregated in the most user friendly manner. Each business segment had their own dedicated sites and were based on the same design principles as its corporate counterpart. They too were powered by the ‘new think’ philosophy and consummated the informative aspect with the aesthetic structure and the poignant aspect of these verticals. 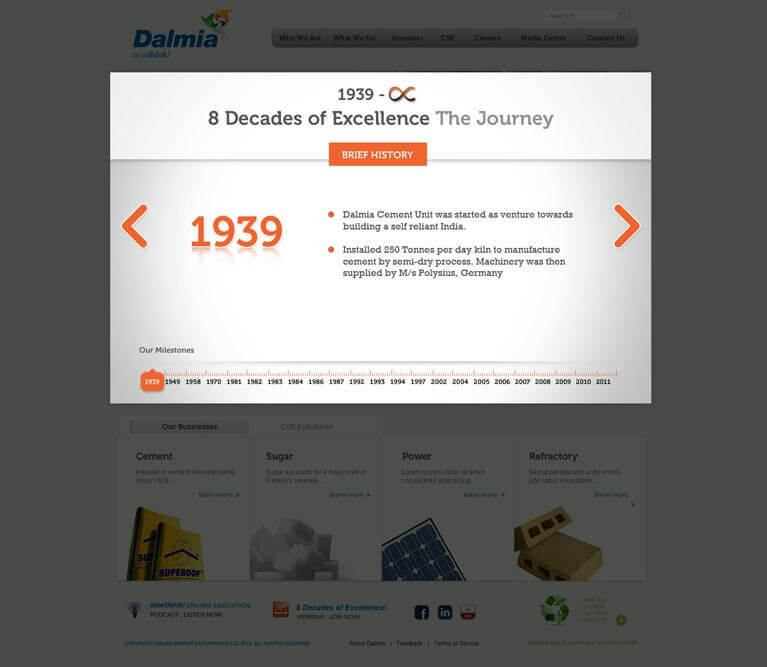 We worked to retain the Dalmia pride through the designs and content and help visitors look at their heritage through the eyes of youth. This Website won the best corporate award in 2013.